Some people care more about the temperature of their beers than others, and my friend Geir Ove has gone further than most. He convinced his wife they needed a new refridgerator, and once they'd bought it he took the old for use as a beer refridgerator. It's at all times filled up with four kegs of homebrew, plus innumerable bottles from all over the world. This was all fine, as far as it went, but Geir Ove also wanted to make sure that the brew would have the right temperature. To this end he bought a digital thermostat and attached it to the fridge. So now there is a digital thermometer inside the fridge, and when the temperature is in the right range (3C to 6C) it cuts the power to the fridge. When the temperature rises above that range, the power comes back on, the the fridge starts cooling again. This is what you see in the picture above. 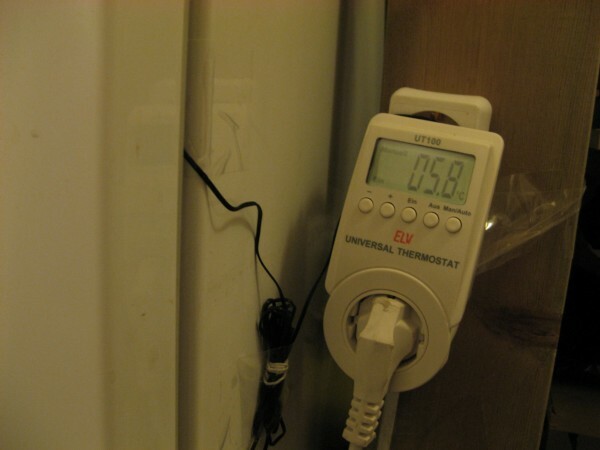 The black cable is for the thermometer, and you can see how the power is attached. We tasted beers out of that fridge all night last night, and the temperature was almost perfect for me, but perhaps a little cold. However, the beer starts getting warmer as soon as you take it out, so by the time we were a little way into the beer it was perfect. Oh, and by the way, happy birthday, Geir Ove! I suppose the right temperature depends on the beer style and the purpose. My favourite styles are barley wines and strong Belgians, and my beer fridge is meant to store those beers for quite some years (cellaring). 12 degrees Celcius is my choice for that, even if it it a bit warmer than, say, in the beer cellar at Kulminator, Antwerpen (7-10 degrees according to the owners).